Images Instagrammed by WWE superstar John Cena. WWE superstar and actor John Cena has an interesting Instagram bio: "Welcome to my Instagram. These images will be posted without explanation, for your interpretation. Enjoy." Consequently, his feed is full of cryptic photographs - including morphed pictures of celebrities like Britney Spears and Steve Jobs - that we can only assume make sense to his 9.9 million Instagram followers. While all of his photographs are posted without any captions, his three latest posts have Indians asking for an explanation, since each features an Indian celebrity. The latest picture on his Instagram, shared about 10 hours ago, is of 'Master Blaster' Sachin Tendulkar. One day ago, he had also shared a picture of comedian Kapil Sharma, and before that, it was singer Daler Mehndi. The three photographs together have collected almost 5 lakh 'likes' and thousands of astonished comments. Sachin's photo with the tricolour has prompted speculation that John Cena is simply marking India's Independence Day - tomorrow - although it's not clear why he would. A commenter on the picture of Kapil Sharma thinks it's the wrestling star's response to "Indian peeps who are asking him to face The Undertaker one more time." Most comments on the Daler Mehndi post are simply helpfully identifying the singer for the benefit of others. Most people, however, think John Cena's account has been hacked. "Which one of you guys hacked John Cena's account???" joked one person in the comments section of Daler Mehndi's pic. "Same guy who hacked Drake," another replied, referring to when Canadian rapper Drake commented on a picture of Suniel Shetty. "Looks like someone's taking over Cena's Instagram!" theorised someone commenting on Sachin Tendulkar's picture. 1st @iamsrk , then @dalermehndi , then @KapilSharmaK9 and today @sachin_rt . @JohnCena Love from India sir, what up with your Instagram post? So @JohnCena put up Instagram posts of pictures of Daler Mahendi and Kapil Sharma. 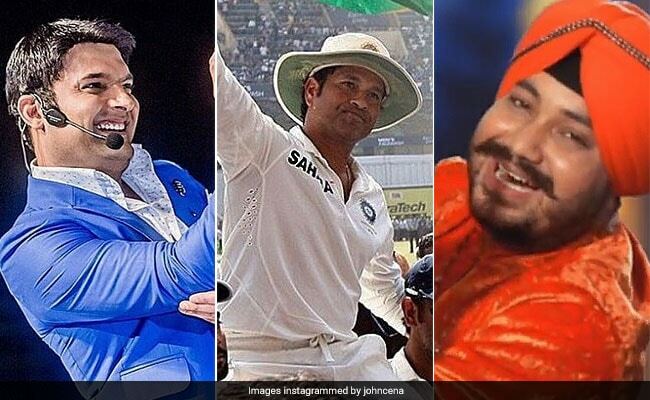 Do you have any theories on why Sachin Tendulkar, Kapil Sharma and Daler Mehndi have suddenly appeared on John Cena's Instagram? Let us know using the comments section below.